Deals and coupons are not something that I talk about much on this site, but they have been a big part of my life for years. I grew up with a mom that spent many hours clipping coupons and matching deals. And this was long before couponing was the popular thing to do. My mom taught me well, and couponing and shopping sales have been something that I have done for years. I will admit that with all of our food allergies, couponing has become a bit more challenging, but it is still possible. I often use coupons and shop sales for cereal, granola bars, and snack foods for those in my house that do not have food issues. I also use coupons for things like cleaners, soaps, canned goods, and more. Coupons are still a big part of my grocery shopping life and I always look for ways I can to cut my grocery budget. I know with grocery prices on the rise and the economy the way it is, many of you are feeling the same need to cut certain areas of your grocery budget that I am. Food is usually the first place people look to when cutting the budget and it is an area I think we can all improve on. I recently purchased the ebook Focused Couponing and was very impressed with Andrea’s approach to couponing. She gives not only tips and ideas, but deals with the common problems with couponing. She talks about budgeting and strategies. She shares her personal story and journey with couponing. She even has a section on saving on organic food items. And when Andrea talks about couponing, she is not talking extreme here. We have all seen the shows and heard about the extreme couponing problems, that is not what this ebook is all about. This ebook shows you how to focus your time and energy and get the most out of your coupons and deals without being extreme. I know many of you have been couponing for years, but I also know many of my readers do not know where to start when it comes to couponing and deal shopping. Others of you may be overwhelmed or discouraged about your experience with coupons and deals. 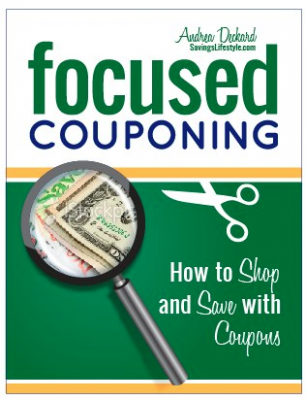 So, for those of you looking to start couponing, or those of you discouraged or overwhelmed with couponing, I think the Focused Couponing ebook is a great place to start your journey of saving money on groceries. And the good news is right now you can use the code 5OFF to get the ebook for $5 off the regular price. That means you can get Focused Couponing for only $4.99. (Which I think you will easily earn back, plus more, by using the tips and ideas in this ebook.) Just enter the code 5OFF at checkout for the discount.